July 13 saw the start of the North Sea Jazz Festival, which ran for three days in Rotterdam at the venue Ahoy. This festival has the highest concentration of musical talent of virtually every discipline -- from English pop star Jamiroquoi and rapper megastar Kanye West to bass giants Marcus Miller and Richard Bona with their respective bands. 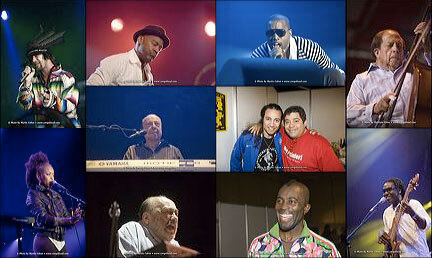 Eight-time Grammy winner Eddie Palmieri was there with LP® artist Giovanni Hidalgo. Cachao, now approaching his 90th birthday, performed with his band that included LP endorser Jimmy Degado. Special thanks is extended to my ever-dependable assistant Dwight Muskita for fetching my family and me from Schipol Airport, and to endorser Jeroen de Rijk for getting us back to the airport for our trip home. Very special thanks also goes to Norman Pattiwael for making sure that the festival percussionists' LP gear was set up properly and in good working condition. Enjoy the images from these historic musical events.